If you’ve just moved home and are looking to kit out your kitchen, then you’ve come to the right place. These days you can just about buy a kitchen appliance for anything you need. So whether you’re a budding chef or you really don’t know where to begin when it comes to anything kitchen related, there are gadgets aplenty to make your life a whole lot easier. Read on for our pick of the best kitchen gadgets you need in your kitchen. Aside from your typical devices such as a toaster, microwave or kettle, you can advance your kitchen and improve your daily tasks with a whole range of electrical gadgets to cater to your needs. We’ve picked out the gadgets that will make your life easier, not harder, and ones that look smart on your kitchen counter without taking up loads of space. First stop when it comes to kitchen gadgets is, of course, the gizmos that encourage healthy eating and make prepping fruit and veg less of a chore. Juicers and smoothie makers are great for this, as you can blend up all your favourite fruits and vegetables with no hassle at all to make a range of drinks and soups. We’ve picked out a few of our favourites to help you get started. Coffee machines are becoming the norm in most modern kitchens and are great for those who struggle to wake up in the morning – plus it’ll save you money in the long run on your daily Starbucks - the Sage Barista Express is our top pick when it comes to countertop coffee machines for your home. But, it's not all standard worktop appliances in our top kitchen gadget list; from risotto slow cookers to free-standing egg poachers to toasters that give you a 'peek' into the cooking process, check out our round up for kitchen gadget inspiration. If you can’t start the day without your dose of caffeine, then this espresso machine is the perfect kitchen gadget for you. The Sage Barista Express is one of the more comprehensive coffee machines on the market and will give you coffee shop quality hot drinks at the touch of a button. Unlike the basic pod machines, this espresso machine features a built-in grinder for coffee beans and a milk frother; so whether you’re a latte or an Americano drinker, you’re bound to make great tasting coffee every morning. If you bake on a regular basis, then save yourself the upper body workout when it comes to kneading, mixing and whisking with this electric hand mixer. It comes with a variety of attachments and works at different speeds to help whip up your ingredients. Some users said they would prefer some slower speed settings, but overall this mixer really makes the length of baking time a lot shorter. Now there’s no excuse not to whip up a storm in the kitchen! Sometimes it feels like there aren’t enough hours in the day to find the time to cook a decent meal, but with this slow cooker, you can have all the time in the world. Simply chuck in your ingredients and leave to cook while you go about your daily plans/chores. A slow cooker is designed to cook ingredients on a very low heat, so it’s safe to leave it while you go out and then you’ll be able to come home to the beautiful smells of a home-cooked meal with minimal effort. 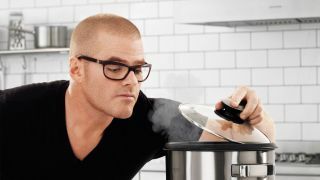 Heston created the Risotto Plus as a multi-function cooker which can make fluffy rice with perfection and can also sautee and sear any dishes for the perfect crisp finish. This is one of the best kitchen gadgets for busy households. The VonShef 4 in 1 Multifunctional 1.5L Blender is ideal for those who like making soups and smoothies as it can blend up any kind of fruit and veg in an instant. You can also grind coffee beans, nuts and spices and whip up marinades, desserts and dressings. This is the best kitchen gadget for making cooking easier as you don’t have to spend time chopping ingredients up by hand, instead you simply chuck them in the Vonshef and press go. It has variable speed settings, but just be aware that larger ingredients may not blend completely smooth unless chopped finely first. Definitely a must have kitchen gadget for every home. If you’re a lover of all things retro, then no doubt you already have a few Smeg items in your kitchen. But why stop there? This Smeg citrus juicer is perfect for your Sunday morning orange juice and its design makes it easy to juice both small and large fruits which can be dispensed directly into your glass. The juicer features anti corrosive components so that you can guarantee it will last you a long time even with frequent juicing and all parts are dishwasher safe for easy cleaning. This is a controversial kitchen gadget that some people think is a genius idea and some think is pointless. But if you have trouble boiling or poaching the perfect egg (or if you’re just extremely lazy), then this machine is for you. It can boil up to 6 eggs at a time and has different settings to produce the perfect dippy or hard boiled eggs. Users love it as it doesn’t fill the kitchen with steam and doesn’t require observation while cooking. If you know someone who is useless at making eggs, this is the best kitchen gadget for them. Whether it’s after school sustenance, a midnight snack or a quick and easy lunch, toastie makers are a must-have kitchen gadget. This deep fill sandwich toaster is great for making loaded grilled cheese and it has interchangeable plates which allow you to make waffles too- great for breakfast on the weekends. The plates are removable, non-stick and dishwasher safe which makes it super low maintenance, and it’s compact so you can store it away in your kitchen if you’re short on counter space. Don’t you hate it when someone else changes the heat level on the toaster and you end up with black and burnt toast? Well, this transparent toaster allows you to clearly see the progress of your item in the toaster, so you know when it’s ready. Yes, this is more of a novelty and it doesn’t actually do anything different to a normal toaster, but if you really hate burnt bread then this would make the ideal addition to your kitchen gadgets collection. Not seen the gadget you need? Check out the best electric can openers, kitchen knives or hand mixers for more kitchen essentials.